Great looking terrain, nice and bleak colour scheme which fits in well with the cultists! Yeah, I too would be very happy to see a reboot of BFG, the general aesthetic of their ships is too good to be left untapped. In the mean time, I've kept an eye on ebay and secured some ships at a reasonnable price...Then, scratch build with heavy use of molds should follow ! I haven't gone back through the old stuff yet, but I'm enjoying your BFG stuff that you've been doing lately. I don't play Age of Sigmar, but that Galrauch model looks cool. Cheers Syro_ ! If I field Old Galrauch, it will probably be as a Helldrake, he'll look the part just fine. Ooooor may in BFG ? as a gigantic demon beast that preys on ships entering the warp ^^. Keep up the good work, and may the Eye watch over you in all you do! @Syro_ : Thanks ! I promise I'll feed him some ships once he is painted ! @Ezra Tyrius : Much appreciated mate, always glad to see you come by. I am definitely looking forward to seeing the a backdrop from you, that was definitely a fun build ! I also entered for the second time in the LOER challenge, and started building arches out of a box of sweets. Those arches look a lot like the cruiser too, if I'm honest. Ahaha, Thanks for warning me monkeytroll ! Seems that Tzeentch has been messing with my copypasting skills ^^ ! That or lack of sleep. Surely Tzeentch though. Nice KernelTerror, the arches are a very original idea. I like the cruiser too. Slaanesh? Thanks Syro_ ! Yes, definitely slaanesh ! 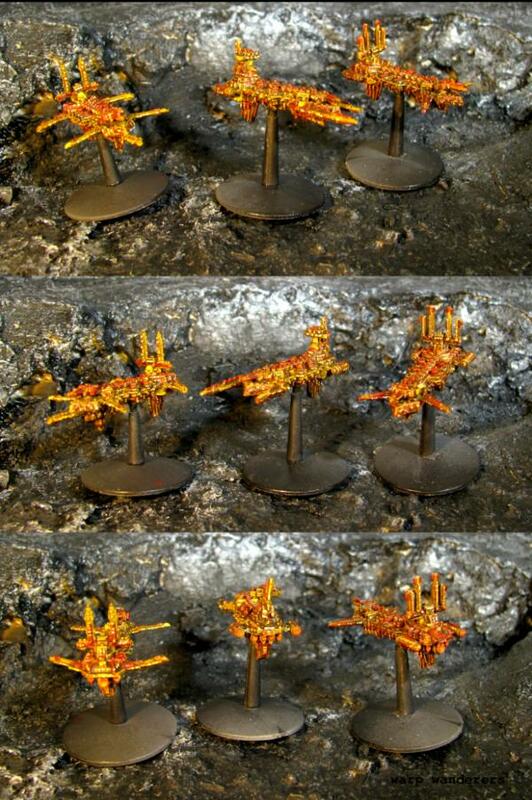 Galrauch looks ace And I think few captains would consider themselves lucky to encounter a Warp Dragon indeed! And that tree stump By the Throne, that thing gives me nightmares by itself! Perfect Chaos spawn/gribbly material, can't wait to see what you do with it! Legs are dry and attached, time to be adding more chaos to this thing ! Glad to hear it MonkeyTroll ! More wires to the face, replace its small tongue with two long ones, and now some hands !